If you’re looking for a way to manage your pre-orders and backorders, I just figured out how to do it with Quickbooks Premier. It’s super easy! Some of Po Campo’s first customers were located in Germany and Japan, so I had to figure out the whole exporting thing early on. Each country seems to require different documents for importing (Thailand is the worst! ), but there are two export documents that you’ll need to prepare regardless of which country you are shipping to: the Packing List and the Commercial Invoice. You probably already have a packing list and invoice template that you use for your domestic shipping but the export versions look a little different and require some additional information. The first time we exported something, I downloaded templates of export documents off of the internet and just kept tweaking them until I found a solution that seemed to make everybody happy. This version is what I am sharing with you now. That said, I hereby absolve myself of any issues you may have with using my commercial invoice template or packing list template. Both of these templates are in Excel, which makes for easy editing. Download the Packing-List-Template and Commercial Invoice template to get started. 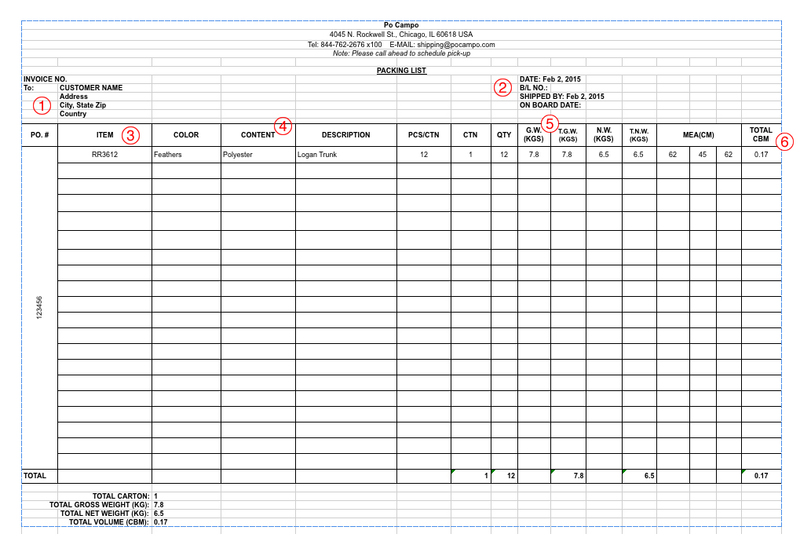 Most of the things on this template are pretty straightforward, like invoice # and PO #. Below are a few lines that might need a little explanation. Download the Packing List template. This should be where the products are shipping from. If your warehouse is separate from your office, use the warehouse address. B/L Number, or Bill of Lading Number. This will be given to you by the shipping company or freight forwarder. Material content. This is important for duty calculation. G.W. and N.W. refer to gross weight (includes the carton) and net weight (product only), respectively. The weight should be in kilograms. The Excel file will calculate the totals based on the number of cartons that you are shipping. CBM is CuBic Meter and refers to how much volume your shipment takes. It is calculated based on your carton dimensions in centimeters. The Excel file will calculate this automatically for you, or you can use this online cbm calculator. The total number of cartons, weights and volume are automatically calculated and noted at the bottom of the spreadsheet. Again, most things on this template are pretty straightforward. 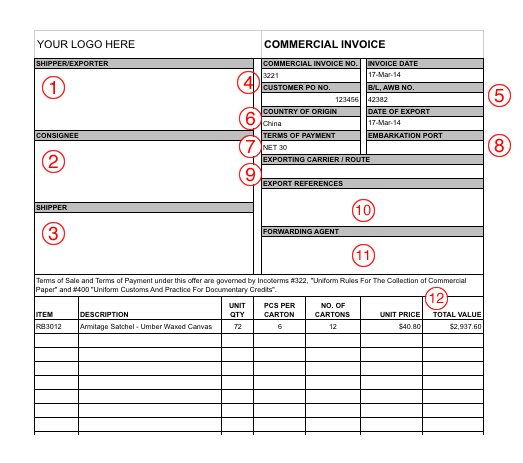 Download the Commercial Invoice template. Shipper is the company actually transporting the goods. My customer typically selects the shipper, and then I put that company’s info here (i.e. Kuehne + Nagel). Commercial Invoice # and PO # MUST match the numbers on the Packing Slip or pandemonium ensues. B/L (Bill of Lading) or AWB (Airway Bill) number will be given to you by the freight forwarder. Country of Origin is where the product was made and can affect duty rates with NAFTA. If you imported materials but made the product in the USA, I think it is alright to put USA in this field. But I’m not an expert! So have your reasoning ready in case someone should ask you about it. Terms of Payment is whatever you decided with your customer. This could say “Prepaid” or “Net 30” or “Due on receipt”, for example. Embarkation Port is the port where the product leaves our country. If you don’t know this, you can leave it blank. Exporting Carrier/Route is the path the shipment will take to go from you to the customer. Sometimes this appears on the B/L. If you don’t know it, you can leave it blank. Export Reference. I honestly don’t know what this is but it’s on every commercial invoice form so I just left it in there. I always leave it blank and haven’t been questioned about it. Fake it ’til you make it! Forwarding Agent is if there is another person or company involved in the shipment that is helping to arrange everything, like a freight forwarder. In my experience, usually the customer (consignee) handles everything and we don’t use a third party, in which case you can just leave this blank. Make sure these prices match what your customer is expecting. It seems that sometimes the customer prepares their own sets of documents and it can cause a lot of confusion if the prices don’t match. After you have export documents prepared, email a PDF of each to both your customer and shipping company to make sure they are satisfied with what you will be providing. If you are shipping your cartons loose, print carton labels for each box with the above information, but label the cartons 1 of 15, 2 of 15, etc, rather than the pallets. The packing slip should be adhered to the outside of the #1 carton. Print two copies of the Bill of Lading given to you by the shipping company. Have the driver of the shipping company sign and date one of the copies for your records and send the other along with him. You may think that it is better to ship on a pallet, but that is not always the case. Many countries insist on fumigating all wooden pallets to kill off any invasive species, which is insanely expensive, so often times it is best to ship loose boxes. If you decide to go the pallet route, I recommend plastic pallets, which cost about $35 each. Depending on the country and company, sometimes the shipping company or freight forwarder will send you more documents to fill out. If you don’t understand what to do with them, call and ask for assistance. You probably won’t be the first person to ask and it’s best to get it right. You might need to know the harmonization code for your product. This refers to the tariff code that classifies products. The U.S. International Trade Commission has a decent HTS Online Reference tool that you can use to look up your code. I use the code 4202.22.3500 for handbags with outer surface of textile materials. Did I leave anything out? Do you do anything differently? Please share in the comments below. After 2.5 years, Po Campo is getting ready to move into a new home! And we’re taking our warehouse with us. There are many places that will warehouse and ship your products for you, so why are we doing it ourselves? You need more space, you have to stock a lot of shipping supplies, and it takes a lot of effort. Short answer: Because we always have. And I kind of like it. And it’s cheaper. When we started Po Campo, we were making just 200 or so bags at a time. My co-founder and I didn’t have space in our apartments to store them, but my parents lived in a nearby suburb and, as empty-nesters, that had plenty of space and liked the thought of helping me with my business any way they could. We trained my parents on how to ship orders and they would dutifully take care of that for us. We did this for the first 3 years of Po Campo’s existence. Once we started importing the bags in 2012, we were getting 8,000 bags at once, rather than at most 500. Clearly that was too much to keep in my parents’ basement, so I started looking for a warehouse space. My friend Annie of Mohop shoes was setting up shop in a raw commercial space and had extra room so we moved in there. Looking back, this would’ve been a good time to outsource the warehousing but honestly it didn’t cross my mind. I don’t know if it is because I didn’t know fulfillment centers existed or because I wasn’t ready to let go of it yet. Our operation still seemed pretty small scale. As it turned out, our first production run from China had a lot of issues. We had to hand inspect every bag before shipping it out, which we wouldn’t have been possible if we had had outsourced it. As the business grew, shipping and fulfillment became more complex. We established processes for shipping items from our online store, how to handle drop-ship accounts, how to export, how to work with different stores’ vendor routing guides (basically very specific instructions on how you ship products to them). We negotiated better UPS rates and got discounts for shipping supplies. We installed software to better manage our inventory and sync with our online store and Quickbooks. I always thought it took my parents so long to ship bags because they were older and slower to learn new things, but it turns out that shipping actually takes time and effort! However, our office/warehouse space had some downsides. It didn’t have a loading dock and we were in the basement, which made moving pallets in and out with the freight elevator a pain in the neck. Also, it was horribly cold in winter and just kind of crappy overall, with flickering fluorescent lights, cracked cement floor and lots of spiderwebs. We were ready for an upgrade. I was picturing moving into a cool lofted studio space that we could use for an office and maybe a showroom and then outsourcing the warehousing and fulfillment. I shopped around and found some suitable fulfillment companies, but after getting estimates on the cost, it turned out to cost about a third more than we were paying to do it ourselves. (See how most fulfillment companies charge below). Was it worth it? I decided it was wiser to just move the warehouse into a better space. After looking at other warehouse spaces, I realized our warehouse was actually pretty small, and could be even smaller if we found a place with taller ceilings. I’m happy to say that I found the kind of lofted studio space I was originally dreaming of, and it’s large enough for a small office and warehouse. I think this space will hold us just fine through the next period of growth, and which time we will reassess. Packing up our current warehouse, getting ready for the move. – It’s often cheaper, assuming you’re not paying for a high rent space. Rawer, commercial flex-space is about half the cost of office space. – If there are any problems with your product, you can catch it before sending it out to your customer. – It’s very time-consuming and you’ll probably want to hire someone to do it. A college student will suffice. – It’s more complicated than you’d think. You’ll have to learn about how shippers work, how to get the best rates and how to do the appropriate documentation. – Depending on your product, it can take up a lot of space. Plus, you’ll need to stock shipping supplies. This isn’t feasible if you live in a high-rent area. Fortunately, Chicago has many affordable spaces in good locations. – You have to be there to do it. I always dreamed of a virtual office, but storing physical inventory means that someone has to be there everyday to ship it out. – Packaging and shipping materials, like boxes, tape, etc. This is more specific than how I account for fulfillment costs in our system. I just have two line items in our books for fulfillment: Shipping costs (i.e. UPS) and fulfillment costs (i.e. shipping supplies and the hourly wage of the person who’s doing the shipping). When I was comparing the cost of doing fulfillment ourselves versus outsourcing it, I went through the painstaking process of determining how much we would’ve spent had we priced everything like an outside fulfillment center does, which is how I found out it would’ve cost roughly $500/month more to have someone else do it.